I robbed that store LEGALLY!! : awesome Hickory Farms Clearance sale!! sorry!! I robbed that store LEGALLY!! I'm Melissa! I'm a 32 y.o. re-employed (9 mo unemployed) wife/mother/fur baby lover who was forced into the hounding world by my genetic "cheap make Lincoln scream" dna link and the need to stretch my very few dollars as far as possible. I also have an addictive personality which is why I choose not to drink/smoke but instead go in cycles of being obsessed with different things in life ranging from shoes, cars, working out, dieting, and now hounding. awesome Hickory Farms Clearance sale!! sorry!! Okay.. basically log on to Hickory Farms through www.mrrebates.com because mr rebates sweetens this deal by giving you back another 7% on top of what a great deal this already is. If you do not have a mr rebates account, sign up, it's free and very easy. Once you log on THROUGH MR REBATES to Hickory Farms (just go to the search box in the upper left hand corner and type Hickory Farms) it brings you to their site. Click on your selection to browse their "items" and deals. They show you the "clearance price" in red. Pick an item(s) you would like to buy, add it to your cart) enter the coupon code SIZZLE for an additional 15% off. better yet, send these packages to our guys/gals over in Iraq or Afghanistan. 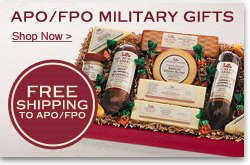 There is FREE SHIPPING TO APO OR FPO ADDRESSES!! WHOO HOOO! So I got the Family Get together gift box, normally $50 on sale for $12.50 then after the SIZZLE code knocked down to $10.62. Mr Rebates will give me back 74 cents so my total for my cousins birthday gift was a whopping $9.88 SHIPPED TO AFGHANISTAN! go me! That's a great deal & they ship it to Afganistan, wow! Save BIG!! Easter Weekend Magazine Sale! Heads up - cookie day 2018 is coming! Without further ado, guidelines some of the popular questions. Walmart is offering free photo with the Easter Bunny!!! Great Deal on Pork Roasts at Food Saver This Week! Goodbye 2010, Hello New Year! On my way to Being FREE! free chicken & what to do with that ham? I ♥ home made 54 calorie mocha fraps! added Meijer Mealbox widget to my side bar! Get the Meijer MealBox widget and many other great free widgets at Widgetbox!